When buying a golf club set one of the important decisions that you will need to make is the type and number of golf clubs to have in your set. While some like the driver, wedge, and putter are basic and easy to choose there are still other clubs that you will need such as the fairway woods, irons, and hybrids. Most golfers know that they need to have irons and fairway woods in their set, but when it comes to the hybrids, this is not the case. Many are not sure and will not know why they need them or how to choose the right ones. But, understanding the difference between the three clubs and what to consider when shopping for hybrids should make things easier for you. However, it is also essential to know that the best hybrid golf clubs for you will depend on your playing style and handicap. Understanding the basics of a golf club is one of those things that many golfers take for granted, but it is still important since it makes it easy to pick the right clubs to have on your set. The iron is one of the standard golf clubs, and it features a clubhead that is thin from the front to the back and a clubface with grooves to impart some spin on the ball. Irons will in most instances have shorter shafts than the fairways woods, and their club heads are also smaller than the later. Apart from the groves the face on an iron will also have a broad, flat and angled face and most are steel or solid iron. The 3-iron and 5-iron are what most players will use but the professionals playing on the PGA Tours will prefer to swing 2, 3 and 4 irons. However, these clubs are harder to use for recreational golfers since they do not have the necessary swing speed or skill. It is because of this reasons that the golf club manufacturers created the hybrid golf clubs. The fairway woods are the club that you will use to make shots from the fairway. These golf clubs will have a metal head just like the irons and drivers, but their heads will be smaller and with a shorter shaft. The fairways woods will offer more accuracy, but they do not produce a lot of distance. And so most golfers will only use them for drives on short holes. Hybrids are relatively a new type of golf club, and their invention or manufacture is meant to address the shortcoming of the irons and fairway woods. Many golfers and experts will also refer to the hybrids as the rescue club, and they will have traits of both the woods and irons. While the center of gravity in the fairway wood will fall towards the back of the head, the hybrids will have their COG towards the front. Many golfers prefer to use hybrids to replace rather than supplement the long irons since they are easier to hit. However, it is okay for players to carry up to 14 clubs in their bag and so it is common for golfers to have both irons and hybrids. Many will prefer to have both the 3-iron and 3-hybrid since they can be useful for different types of shots or situations. Hybrids are slowly becoming a must-have golf club. A majority of Tour professionals are now swinging hybrids, and most armatures also prefer to have them in their golf club set. This popularity means that almost all golf club manufacturers are now making them. However, all are not the same, and they will differ in many other aspects apart from the club number. And so if you are in the market for one or a set it is important to know what to consider when choosing the best hybrid golf clubs. Here are some important points to help you out. The first thing that you should consider when buying a hybrid is what you want it to do or what you are replacing. Consider whether you want to get more control than what your long irons can provide or bridge the gap between the fairway woods and the long irons. Knowing whether you want to replace an iron/fairway wood or supplement it is important because it makes it easy to determine the appropriate loft of the hybrid that you should buy. The loft will always be determined by what you would want the hybrid to do. If you want one to replace your 3-iron, you should go for those with a loft of between 20 and 24 degrees. However, if you want something that will offer better control than your fairway, then something with a loft that is below 15 degrees will be the best pick. Traditionally hybrids with a loft of 15 degrees will replace the 3-iron while the 17-degree ones replace the 5-iron. Like many other golf clubs, you will need to choose between the graphite and steel shaft when buying a hybrid. If you are not sure what to buy the best idea is always to try both and decide what feels the best when swinging. However, graphite is the most popular shaft material for both low and high handicap players. The only other thing that you will need to consider when it comes to the shaft is the flex. For this, the right idea is to match the flex to that of your fairways woods and irons, but stiff shafts seem to work best for beginners and armatures. You should always match the offset on your hybrids to that on your woods and irons. Doing this will minimize the effect of having a different club design on your set and help to ensure consistency in all your shots. However, the offset on the hybrids will depend on personal preference and your skills because players with a low handicap will prefer hybrids with as little offset as possible. Apart from the four main factors above, there are still many other things that you need to acknowledge when buying the best hybrid golf clubs. Key among them is the price or your budget because some models can cost as much as $300 or even more, but you can always find something with a reasonable price tag. Reading hybrid golf club reviews is also vital since it will help you know the experiences of other golfers with the same handicap. It is also important to go for something that conforms to your handicap. The best hybrid golf clubs for high handicappers are those that are easy to swing and more forgiving, but those with a low handicap will prefer something heavier with a stiffer shaft. Also, do not forget to try your hybrid at the store before buying because some of the club heads on hybrids make it harder to hit the ball. The redesigned shallow face is what stands out when you get this club because it makes it look smaller than the typical hybrids. But, despite the small size this golf club still performs well for both low and high handicappers. Also, the matte black finish is hard to miss as it is what many players prefer to have in most of their golf clubs since it helps with alignment and reduces glare. Once you get used to the impressive appearance of this hybrid the other features that make this a top notch golf club include the Hyper Speed Face Cup, Internal Standing Wave Technology, and a High MOI. This golf club also features a graphite shaft that is available in both regular and stiff flexes. Hyper Speed Face Cup: Callaway uses a forged Hyper Speed Face Cup to increase the ball speed across the face to ensure that you always get maximum distance with every shot. Also, this technology increases forgiveness on all impact locations and even when you make off center hits. Internal Standing Wave: The re-engineered Internal Standing Wave technology provides more distance, lowers the spin and also increases the versatility of this hybrid. High MOI: This club has a higher MOI and one of the lowest center of gravity that you can get in a hybrid golf club. The company achieves this by positioning more of the weight low and around the perimeter. Shaft: The XR Pro comes with a graphite shaft which is suitable for most handicaps, and it is available in both stiff and regular flexes. Look: This hybrid has a stylish matte black finish which most golfers seem to like. Also, it has a sporty look on the sole, and most players will also love the subtle alignment aid on the head. The shallow face increases forgiveness from the fairway. Callaway uses an internal standing wave to provide more distance, lower the spin and make it a more versatile hybrid. It has a lower center of gravity than most other hybrids. This hybrid is a little heavier than others and hence also more consistent at high swing speeds. The hyper speed cup increases the ball speed across the face. More MOI allows the face cup to flex for greater speed and forgiveness. This hybrid is a little smaller than typical hybrids. Some players will find the shaft stiffer than the “ordinary stiff”. It is not an adjustable club. The length of this hybrid is its most outstanding feature, and it is the first element that will catch a golfer’s attention. This hybrid is also very forgiving, and Callaway designs it to optimize your shot shape which makes it very versatile. Also, the company makes it with an adjustable hosel that lets you choose from 8 lofts and lie angle combinations. 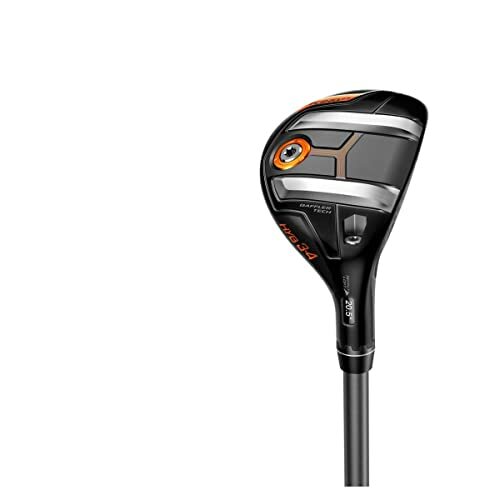 Callaway makes this hybrid club with a Hyper Speed Cup that ensures that you get maximum ball speed across the face. This golf club also comes with a graphite shaft that is available in three different flexes, and it has a low COG and a high MOI to increase balls speed and maximize forgiveness. Speed Frame Face: The fast ball speeds are one of the factors that set the Big Bertha apart from other hybrids. This impressive ball speed comes from the Hyper Speed Cup that ensures that you always get maximum speed throughout the club face. OptiFit Adjustability: If you are on the market for an adjustable hybrid this is one of the best that you can get. It comes with an adjustable hosel that makes it possible to get up to 8 different lofts and lie angle combinations. Low COG: Callaway gives this hybrid a low COG and a high MOI to enhance the ball speed and ensure maximum forgiveness. Shaft: The Big Bertha features a UST Recoil graphite shaft that is available in stiff, regular and senior flex. Look: You can tell that this is a Callaway club just from the look and finish. Although the design and graphics on the club head look a little busy, the matte finish still manages to give the hybrid an impressive overall appearance. The thin, light and robust design makes it fast throughout the face. It has a high MOI for maximum forgiveness and ball speed. Callaway gives it an adjustable hosel that makes it possible to get up to 8 lofts and lie angle combinations. This hybrid will always optimize your shot shape. It is a versatile club that is playable for various shots. The Big Bertha is easier to launch higher than most other hybrids. It is easy to hit even for beginners. This hybrid does not come with any instructions on how to adjust the head. It might be longer than what some golfers anticipate, and so it will take some time to get used to it. Cobra is famous for making some aesthetically appealing golf clubs, and their Men’s KING F7 hybrid lives up to this reputation. Like any other golf club, the appearance is what will make the first impression when you get this hybrid from the box. The compact black head will impress most “traditionalist” golfers, and it also features a cobra logo and some crown markings to make alignment easy. The other features that make this a top notch hybrid include the Dual Rail System, Stainless Steel Face, MYFLY8 with SMARTPAD and placement of the center of gravity at the back of the head and with a fixed weight. Dual Rail System: The new rail design provides an outstanding turf interaction and ensures that you always get consistency from all lies. Back COG: Cobra places the center of gravity at the back using a single fixed weight that produces a high flying ball to maximize forgiveness and increase the distance. Stainless Steel Face: The forged 455 stainless steel face creates a lighter and thinner face that maximizes the face flexing to create fast ball speeds and maximize distance even on off center hits. MYFLY8/SMARTPAD: This technology provides up to 8 loft settings that are easy to adjust, and they make it possible to manage and customize the ball trajectory. Feel: This club feels balanced during the swing, and it is pretty solid at impact. Also, it is quite weighty and powerful as it slides through the turf. Look: The small black head with the Cobra logo and markings on the crown give this hybrid an appealing look while also making alignment easy. The innovative COG placement results into a high ball flight to give you extreme distances and maximum forgiveness. It has an improved turf interaction and consistency from all lies. Cobra makes it with forged stainless steel to create a thinner face that maximizes the flex to provide greater ball speeds and more distance even on off center hits. It has 8 loft settings that are easy to adjust for managing the trajectory. This hybrid is available in three different flex options. The rails technology helps to provide ultimate forgiveness. It is a little too firm at impact for some golfers. The low spin rate is a significant shortcoming. The low-profile head design is the highlight of this hybrid, but it also has a noticeably shallower face that provides an easy and high launch to ensure excellent playability. 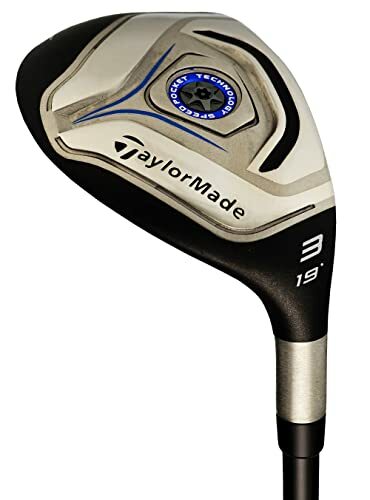 Apart from the design of the head, this golf club has a typical hybrid look with some conservative black and blue graphics. Also, the excellent stability of this weighty club is hard to miss when you swing it for the first time. The TaylorMade N1122407 also features an improved Speed Pocket for fast ball speeds, Low and forward COG and a Matrix Velox T Shaft. This graphite shaft is available in regular, stiff and senior flex. Speed Pocket: TaylorMade gives this hybrid a new speed pocket that is also more efficient than the previous ones, and it promotes fast ball speeds so that you always get long distances with every shot. Low and Forward COG: Placement of the center of gravity low and forward on the head promotes fast ball speeds and also encourages low spin to create optimal launch conditions. Matrix Velox T Shaft: This variable weight shaft promotes the feel and ensures that you get maximum control for all swing speeds. Look and Feel: This golf club has a typical hybrid look but with some traditional blue and black graphics. When it comes to the feel, most golfers will find it more solid, and it is also a weighty club with excellent stability. It has an efficient speed pocket design to promote ball speed to maximize the distance. The low and forward center of gravity also creates fast ball speeds and lowers the spin for optimal launch conditions. 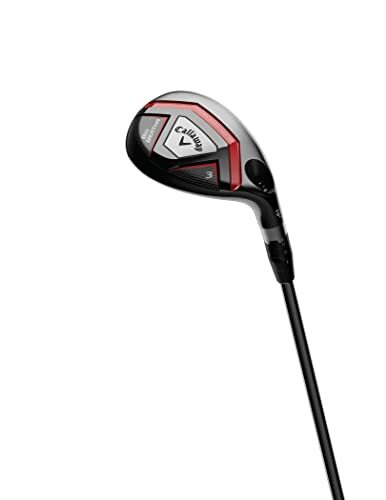 This TaylorMade hybrid has a high strength steel face that will also help to improve the distance. A low-profile head that also has a shallow face offers exceptional playability. You can be confident of maximum control and for all swing speeds thanks to the Matrix Velox T Shaft. This hybrid also comes with a cover for the head. It is a very affordable hybrid despite its top notch quality. It will be too weighty for some golfers. This hybrid is not the best when it comes to precision. The compact and minimalistic setup that also features a clean teardrop silhouette and some simple graphics is the first element that you notice on this club. This appearance is enough to convince you that the club can dig into almost anything. Also, the industrial underside and the Ghost Slot which is a filled in cut-out will help to project power. 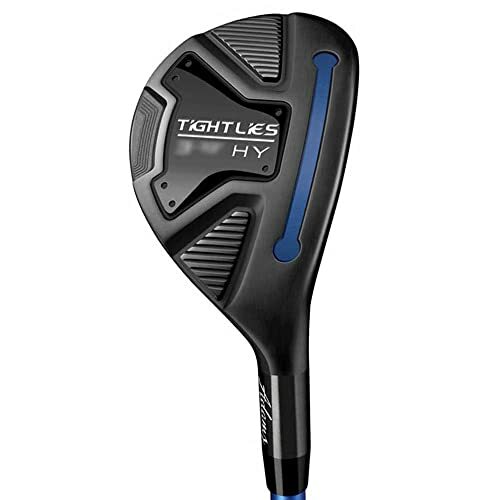 Other features that make this one of the best hybrid clubs include the Tri Level sole design, Low Profile with an upside down design and a graphite shaft that is available in both senior and regular flexes. Ghost Slot Technology: Although the Ghost Slot is one of the key elements of this hybrid it is hard to see it without looking carefully. This slot creates a face that is more flexible to ensure that the ball always jumps of fast and more accurately even on mis-hits. Tri Level Sole: The Tri Level sole design reduces the turf interaction to improve the performance of the club from any lie. Low Profile: The low profile and upside down design of the club head creates a large impact area and low on the face to prevent misses. 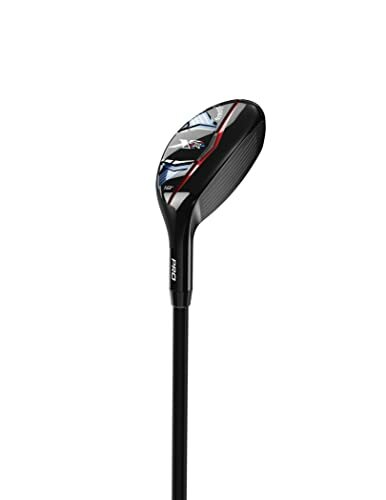 Shaft: This hybrid features a graphite shaft that is available in regular and senior flexes. Look and Feel: Adam Tight Lie features a compact and minimalistic appearance with a clean teardrop silhouette finish. For the feel, you get a tense and tidy sense of compressions on impact. The low profile and upside down design create a large impact area that makes it hard to miss. It provides an impressive performance from any lie thanks to the tri level sole design. Ghost slot tech increases forgiveness and creates higher ball speeds. It is a cheap but high-quality hybrid. This golf club comes with a headcover, and so you will not need to spend extra cash. It has a fast flexing face but without off-putting slots. A few golfers will find the graphics too dull and boring. The black face and sole will scuff up a little after a while. The hybrid golf clubs help to solve the shortcomings of the fairway woods and irons. These clubs are relatively new but they are vital for modern day golfers, and once you get used to them you will not want to go to the course without them. However, to get the most from them, you will need to choose the best hybrid golf clubs from the many options out there. And for this, our guide above and reviews will be very beneficial.